With the internet, we’re able to do a Google search for an HVAC contractor and find dozens of results. It’s never been easier to find local contractors. Yet, it’s never been harder to decide on a local contractor. Choice-overload is real, and it’s preventing you from dialing the right contractor. But even among all the contractors out there, a good contractor is going to operate in a way that goes above and beyond just simple repairs or installation. 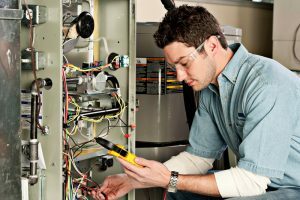 Keep reading and we’ll explain a couple of qualities that make a good HVAC contractor in Deptford Township stand out. A less-than-good HVAC contractor is fixated on getting in, installing a new system for you, and getting out. They’re thinking of you only in the short-term. Home Inspection: Using the proper tools and skills, a thorough inspection will find the areas of your home that are preventing your HVAC system from running at the highest efficiency. Energy and Heat Recovery Ventilators: Devices that bring fresh air into your home without wasting energy. Duct Sealing: The process of eliminating leaks and disconnects in your duct work. Leaks can lose up to 30% of your conditioned or heated air. An HVAC contractor deals with all things air inside your home. While most people commonly associate that with just heating and air conditioning, there’s another big part of that equation: air quality. Indoor air quality is not something to be taken lightly. There are many pollutants and contaminants that can fill your home, sometimes making your indoor air several times worse than the air outdoors. Poor indoor air quality can exacerbate symptoms of allergies and asthma, and during the colder seasons when our immune systems are compromised, it can encourage illness. Duct Cleaning: The air ducts are responsible for sending heated and cooled air through your home, and they can get dirty over time. A thorough duct cleaning prevents that dust and dirt from circulating into your airflow. Air Cleaners: Electronic and mechanical air filters will actively reduce the number of contaminants in your air circulation. Everything from dust and pet dander to smoke and chemical pollutants can be eliminated with the right filter or purifier. Humidifiers: Dry air isn’t just uncomfortable—it prevents our sinuses and immune systems from functioning properly, thus introducing us to the risk of illness. A whole-house humidifier will help bring in the necessary amount of moisture. If you need the help of not just any HVAC contractor, but a good one, then you can count on us! Contact SPS Mechanical Inc. today for Comfort At Your Service.